Greg Hettinger keeps catching a beating and keeps on ticking. 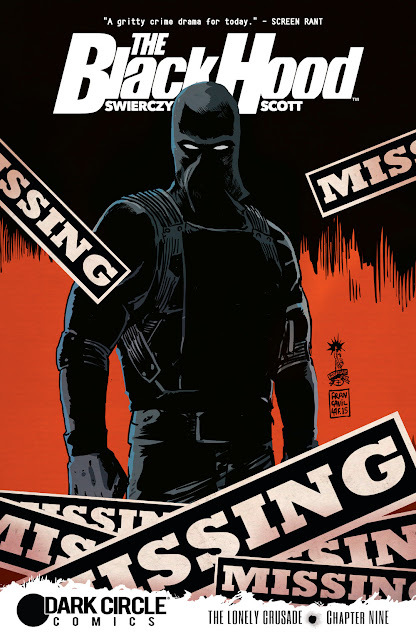 If there was one comic book that would discourage a reader to become a vigilante it's 'The Black Hood.' Unlike, Marvel's Punisher or even DC Comics' 1980's Vigilante, Greg is not as indestructible as those guys. Greg gets hit, a lot, but his determination to bring the bad guys to justice is admirable but it's coming at a cost. In pursuit of the Crusaders, Greg gets in over his head. Duane Swierczynski does a clever job of intertwining the story of a homeless informant that chronicles his life and how it mirrors the downfall of the neighborhood. It's executed well and there is a payoff because of it but still felt a little awkward. Nonetheless, Greg continues to undermine his recovery by lying to those around him and spending his nights looking for the Crusaders. I wish I knew what the Crusaders represented and what they were up to, in order to show the stakes that are involved and justify the risks Greg was taking. The ambiguity about this arc's villains is confounding. Greg Scott continues the gritty and grainy noir-style art that Michael Gaydos started in the first arc. Scott does change it up at times between the sepia-toned flashbacks and the modern-day fight scenes, there is enough distinction to clearly detail the time periods. Scott excels at choreographing and laying out the fight scene. Some individual panels pop with heavy contrast, a bloody punch exploding across the face on a black background is rather stunning. 'The Black Hood' continues to be a bit of quandary. Greg, the recovering drug addict/policeman/vigilante, has some serious growing pains as a street level hero. As often as he gets beat up it's a miracle he's alive and able to solve cases at the same time. If this is suppose to be a realistic portrayal of a regular man taking justice into his own hands then we're seeing everything that could go wrong with such an idea. It's both refreshing and frustrating to see a flawed hero with good intentions but perhaps ill-equipped for fighting crime in a mask. Our hero Greg is no superman just a scrappy cop who can take a punch. The series will need to move along Greg's evolution, making him stronger and smarter, in order to give readers a reason to come back.